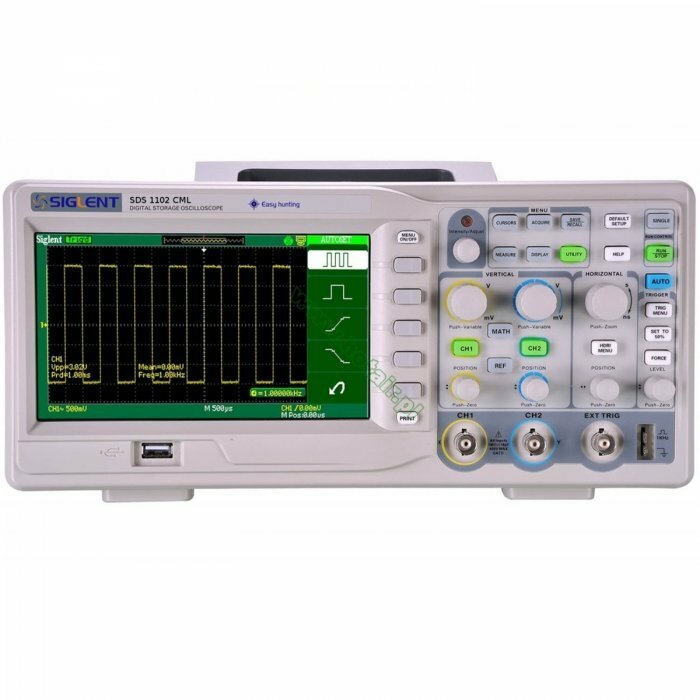 The SDS1102CML+ is a dual-channel digital oscilloscope with in-built single-shot bandwidth of 100MHz, single real-time sampling rate up to 1GSa/s and equivalent sampling rate up to 50GSa/s and memory depth of 2Mpts. All of Siglent’s CML range of oscilloscopes also come as standard with a large, 7-inch LCD screen for viewing and monitoring changes in waveforms. This screen is also presented in full colour, allowing users to easily identify waveforms and track them accurately. The CML range also includes unique digital filter functions that allow users to use high pass, low pass, band pass and band stop digital filters to extract noise from readings, multiple trigger types (Edge, Pulse, Video, Slope and Alternative) and also includes the ability to extract data using the included USB and RS-232 ports. This data can then be analysed at a later time using the included software package (which also enables remote operation of the oscilloscope).